kappa__2 wrote: Downloaded and tried, Nicely done. Thanks! I wonder if setting max_cstate in the grub config might help avoid the touchscreen turning off; I'll have a go at that at some point unless anyone else has already tried? Thanks cliche for the great work you have done and also to pkirchhofer for producing the first image. The image you've produced was slightly larger than the original, so I had errors writing to my old and cheap 2GB USB stick. But this was solved by writing it to a larger stick then using GPartEd to resize the last EXT4 Android System partition down to 900MB, and then I copied all the 4 partitions over to my 2GB stick then just resized to the max the last partition, now on the 2GB stick. Put it in the joggler and booted fine. I set the stay awake option and all was fine. But I use a mouse and keyboard on it, so even if the touch screen turns off, I'm guessing it wont be an issue. I've used the touch screen a bit, but to be honest, I prefer to use a mouse and keyboard with the Joggler. One issue I've had, and I seem to recall this being a general issue with v4 upwards on android, is using the ethernet port. It doesn't work by plugging the cable in, and I can't see any options in the setting for a wired network. Juggler wrote: The image you've produced was slightly larger than the original, so I had errors writing to my old and cheap 2GB USB stick. That's odd - it's the same image file, just edited - I wouldn't have thought it could increase in size. However I was testing it on an 8Gb stick so wouldn't have noticed. Juggler wrote: I set the stay awake option and all was fine. But I use a mouse and keyboard on it, so even if the touch screen turns off, I'm guessing it wont be an issue. I'd be interested to know if you can wake it using the mouse/keyboard once it goes to sleep properly (not just screen dim) - I've been playing with cstate settings without success so far. However, the 'stay awake' workaround doesn't seem to be that much of a problem. Juggler wrote: One issue I've had, and I seem to recall this being a general issue with v4 upwards on android, is using the ethernet port. It doesn't work by plugging the cable in, and I can't see any options in the setting for a wired network. I can't remember which thread I saw it in, but you can apparently get wired networking going manually, through the console and using ifconfig-type commands. I think the Play Store doesn't play nicely with it though. Thanks, I'm looking for a solution that will run tunein and a generic upnp player. Even if this isn't stable yet, is this likely to be a goer? Do I just need to write the img file to a stick using WinDisk 32? The native Tunein app doesn't seem to run on these x86 builds but it's dead easy to install the Squeezeplayer and Squeezebox apps and then you can run Tunein as an add-on. UPNP video is a no-go but for audio you can use the upnplay app (or even better IMHO - use Squeezeplayer for audio streaming). Does any clever person know how to get aac files to play? I've contacted the Squeezeplayer dev but he said that because of the need for backward compatibility with earlier versions of Android he could not add it to his app at present. Massive thanks again to cliche for sorting out all of the bugs, this build is so much better than the Froyo one I have been limping along with! Last edited by toadmazter on Tue Jan 07, 2014 11:24 pm, edited 1 time in total. dwl99 wrote: Does any clever person know how to get aac files to play? I've contacted the Squeezeplayer dev but he said that because of the need for backward compatibility with earlier versions of Android he could not add it to his app at present. Where do you run your LMS? In theory if a player in a squeezebox system can't natively play aac then LMS should transcode, most likely to flac for playback. My music sits on a Zyxel NSA210 with LMS running on it. It's fine if I use Squeezeplay OS on the Joggler to play music but if I use Android with the Squeezeplayer & the Squeezebox apps it won't play aac. 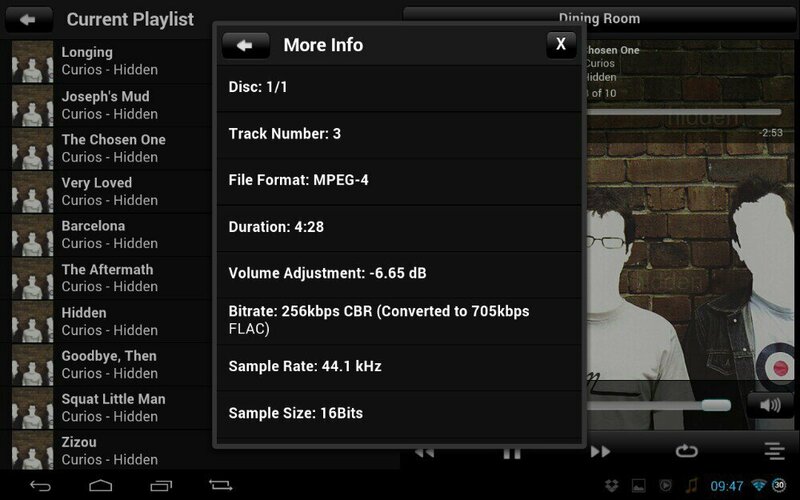 It's fine with flac. Actually, your comment has just made me realise that LMS is possibly transcoding the flac files but not the aac ones which are being transcoded locally by Squeezeplay OS. So I probably just need an aac plugin for LMS on the NAS. Hmm, I cannot see any mention of an aac/m4a plugin on the LMS setup page or google. Any thoughts? The aac files are non-DRM if that makes any difference. There's no transcoding with flac unless you specify it. Flac is a supported format. Do you have LMS installed on your SqPOS joggler at all? I'm fairly sure LMS on the joggler can transcode aac but I'm not sure if LMS on the NAS will have either the grunt to transcode or the required codecs installed. Another possibility is that squeezeplay on the joggler either natively plays aac or can use mplayer on SqPOS to play it. I must admit I do find aac support slightly confusing and didn't think squeezeplay on the joggler would play it unless it was transcoded by LMS but now I'm not sure. Let me have a look and see if I've got any aac files to test it. OK so as a test I added some .m4a files to my library. This is squeeplay running on a Joggler, squeezeplayer running on my Nexus7 and LMS serving the files to both devices running SqPOS. Playback works on both. 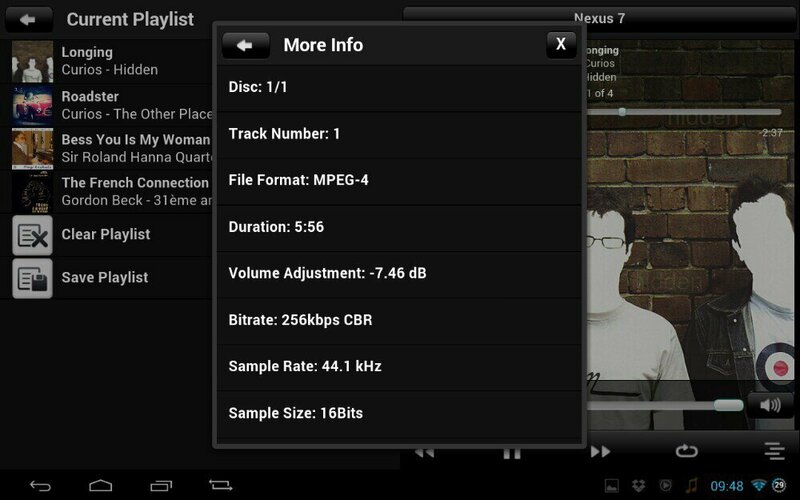 However on the joggler the more info states it's converted to FLAC however on the Nexus it says no such thing. Maybe squeezeplayer running on Android is different if it's running on x86 versions of Android, whereas my Nexus is using the ARM version. Or maybe LMS on the Joggler is able to do something different to LMS on you Zyxel. Might be worth trying LMS on your Joggler and see what happens. Does this build contain Lib_Houdini for ARM Binary Translation or is this strictly x86 only? Using Cliche's edited image, I cannot get this to boot at all. I've tried burning the image to usb using dd on a mac, and Win32DiskImager on Windows XP, in both cases it fails to boot. I can confirm the USB stick is good, as I can boot any other of the images I've played with. The partition structure and data is correctly put to the stick, so I'm out of ideas? Hmm me too just hanging on O2 logo , the image seems to extract ok and I checked for hidden file extensions . No go for me . Anyone had this booting yet ? Yey working now and typing this on it . I tried winzip to extract instead of z7 booted it up and it seemed to hang , I just left it as had to bath my little one and when I came back downstairs it had booted up so not sure if it was just that it needed left or that I used winzip the version of win32 I used is 0.7 . Thanks for the help Dave , what is the file you have posted to nuke the stick before flashing? Great work guys thanks for this build. Is there any way to force apps in to open up in landscape ? A few I have tried open up in portrait which is a shame . The bootsector.img file wipes any bootsector on the USB - sometimes if a USB stick has previously been used as a boot drive a simple reflash or format leaves some of the old stuff behind. It's also a great tool for resuscitating SD cards & USB drives that can't be formatted because of errors. It's a shame that some apps insist on portrait mode, there's not really a way round this other than contacting the devs. The first thing to do once this build is running is install Nova Launcher and ditch Trebuchet which is full of graphical glitches. I then used Titanium Backup to remove Trebuchet. And once it's set up to your liking make sure you make a backup image with win32diskimager!! !